You can place wagers on sports, horses, in their casino, on bingo or in their poker room all from the same account. When you are ready to make your first deposit at SportsBetting.ag you can do so safe in the knowledge that you are about to be rewarded with a 75 percent up to $1,000 bonus on your initial deposit amount. Create your free account, make a deposit of at least $25 using the bonus code NEW1000 and SportsBetting.ag matches it 100 percent up to a maximum of $1,000. To claim the bonus, you must not have any free plays in your account, no withdrawals can be made within 30 days of claiming the bonus, and there is a 12x (12 times) rollover requirement. 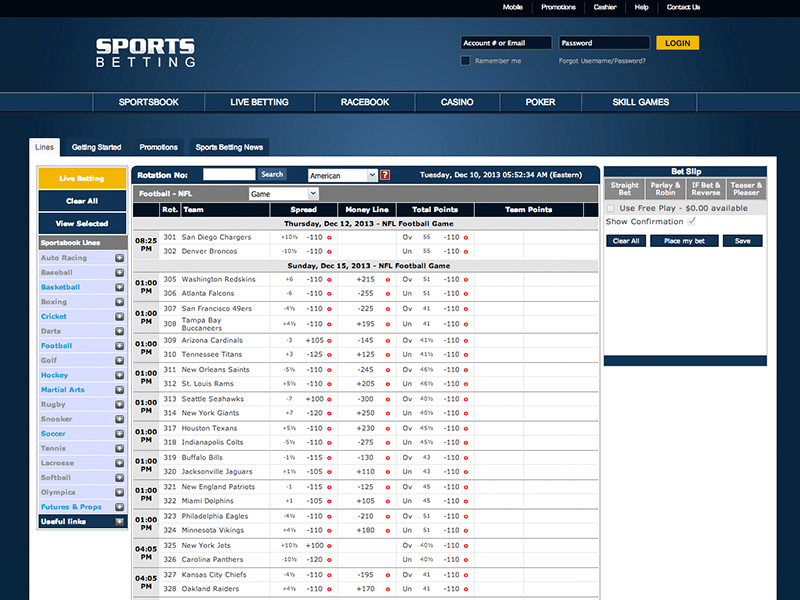 The list of deposit options at SportsBetting.ag is well populated. They accept Bitcoin and Litecoin, Visa, MasterCard, American Express, Visa via Person to Person, Person to Person, Skrill/Moneybookers, Book to Book, money orders, checks and wire transfers. Customers are entitled to a $50 discount once per 30 days on the withdrawal method of their choice, as long as they make the withdrawal on a Friday. You only need to look at the promotions on offer at SportsBetting.ag to see why thousands of U.S.-based sports bettors have it as their site of choice, and why it continues to attract gamblers in droves. The website is clean, crisp, and the blue background really works well with the company’s choice of fonts and other colors, while each page loads quickly, allowing you to navigate across the site with consummate ease. When it comes to betting markets you are really spoiled for choice, with markets available in baseball, basketball, football, hockey, soccer, tennis, boxing, cricket, darts, and even esports, all with industry-leading betting odds. Add to this the fact SportsBetting.ag has one of the best customer service teams of any gambling entity, and you have the perfect sports betting, casino, and poker site for you. The minimum deposit needed to trigger the 75 percent welcome bonus is $25, which means the least you’ll receive as a bonus is $18.75. Conversely, the maximum bonus you can receive is $1,000 and for this you need to deposit $1,333.33. Currently, the 75 percent up to $1,000 Sportsbetting.ag welcome bonus requires a 12x (12 times) rollover, while the 25 percent bonus for life reload bonus commands a 6x (six times) rollover requirement. Two superb bonuses are available in the SportsBetting.ag racebook. The first is a $25 risk-free horse racing bet. Simply make your first bet at the racebook and if it wins give yourself a pat on the back because you’re already profited from your horse racing bets. However, if it loses, email freeplay@sportsbetting.ag with your account number and the ticket number of the single horse bet you want a refund on, and your bet will be reimbursed up to $25. The second SportsBetting.ag racebook promotion offers seven percent daily rebates on your betting action. So long as the bets are not matchup bets, fixed odds bets, prop bets, tracks in categories D & E, and are not wagers that pay $2.20 or less for $2.00, you receive seven per cent back every day. There are no minimum volume of wagers to claim this bonus and there is no limit to how much you can earn. It is worth checking the SportsBetting.ag website for the current betting sites codes required to claim the various bonuses. At present, you need to use the bonus code NEW1000 to claim the 75$ up to $1,000 welcome bonus and FORLIFE to get your hands on the 25 per cent up to $1,000 bonus for life reload bonus. It is not only the sportsbook players that have promotions galore because casino players are well catered for at SportsBetting.ag. For starters, they offer new players a 100 percent casino welcome bonus on each of your first three deposits. To claim your three bonuses you simply need to deposit between $25 and $1,000 and use the following promo codes: CASINO1 on your first deposit, CASINO2 on your second deposit, and CASINO3 on your third deposit. When you try their Live Dealer games, your first bet, up to $25, is risk-free with any losing bets being refunded. You can also bank 10 percent rebates every week for your casino play so long as you lost $100 or more during the week. There’s also a 25 percent up to $1,000 casino re-up bonus available each time you decide to reload your casino account, with no limits on the number of reloads you make. However, there is a 50x rollover and you can’t make a withdrawal until the full bonus and deposit amount is rolled over. When you play at the SportsBetting.ag casino, you can claim a monthly rebate of 20 percent on what you've deposited and spent in the casino. Online poker is available at SportsBetting.ag and it comes with tons of promotions, including a 100 percent matching bonus on your first deposit, released in $5 increments, and a $5,000 new player freeroll when making your first deposit. a $20,000 multi-table tournament leaderboard challenge, a $5,000 weekly sit ‘n’ go challenge, hit & run freerolls, and more than $100,000 in guaranteed prize pools every weekend. Promotions are one area in which SportsBetting.ag excels. In addition to the 75 percent up to $1,000 welcome bonus, you are entitled to a 25 percent bonus up to $1,000 every time you make a deposit into your SportsBetting.ag account. Throw into the mix a $100 refer-a-friend bonus, $25 risk-free bet when you use in-game betting for the first time, a free $50 mobile bet, reduced NHL juice, MLB Dime Lines, free live dealer casino bets up to $25, a $25 free horse bet, and seven per cent horse rebates, and you can see why SportsBetting.ag is one of the most popular online betting sites in the world today. If you've never deposited at SportsBetting.ag with Bitcoin before, they want you to give it a try. You can earn a special 100 percent bonus on your first-ever deposit via Bitcoin. Use promo code 2017BTC and SportsBetting.ag will match your deposit dollar for dollar from $20 all the way up to $1,000. Close Visit Sportsbetting and see for yourself... Ok! Let's Check Out Sportsbetting!